No modern technology has ever had such a schizophrenic and complicated identity as Atomic Energy. It is often presented in mystical terms. A Pandora’s Box of knowledge that cannot be unlearned. The magical Genie that can do both help or harm but cannot be returned to his bottle. Nuclear Power is the ultimate parable of modern science. With the use of atomic bombs at the end of World War II the world became aware of the god-like power of atomic fission. Newsreels of the horrible destruction and disfigured civilians created a closet of guilty conscience. But stronger than the fears and guilt was optimism. There seemed to be no limit to what modern technology could accomplish. The idea of transforming the evil power that could destroy the world into an ultimate energy source to help mankind was irresistible. The peaceful use of atomic power; what would come to be called “Atoms for Peace”. 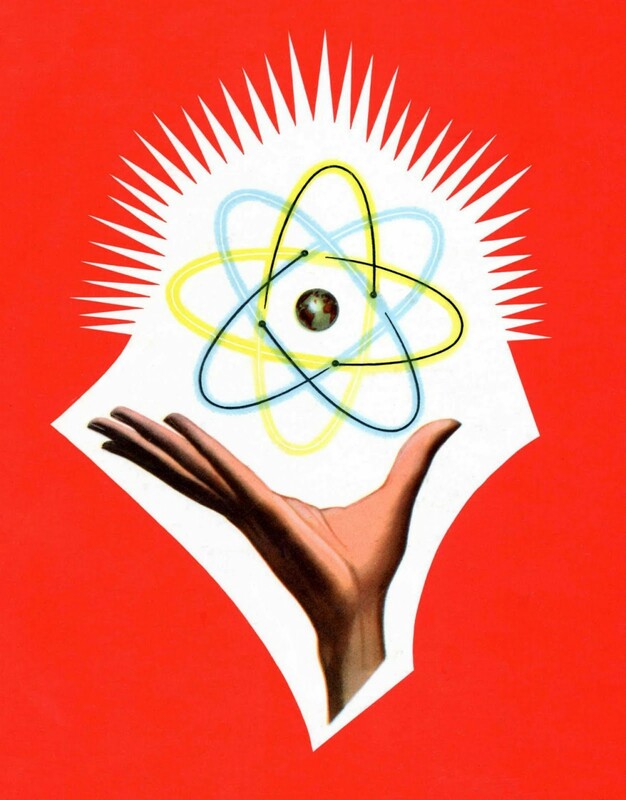 Atomic energy involves radiation, an invisible specter that was unsettling and spooky. Radiation was a central evil in countless science fiction movies. It’s ability to cause anything from giant man-eating insects to an army of glowing zombies were common, but a well known myth. The true science about atomic fission and it’s potentials and limitations was complicated and boring. Ironically the main use of atomic energy is as modern as a steam engine. Atomic submarines, ships and power plants use the interaction of enriched uranium as ‘atomic fire’, instead of coal or oil, to boil water into steam that drives electrical generators or propellers. The big advantage was that it takes a tiny amount of uranium to do the same job as huge amounts of normal ‘fossil fuel’. Secondly there are no old fashioned waste products like smoke or carbon dioxide. At the time no one seemed concerned about the new and futuristic waste that would be small but spectacularly deadly. It was all clean, efficient and very modern.